Chhattisgarh is the 10th largest state and 16th most populated state of India. Famed as one of the electricity and steel producing states of India, Chhattisgarh was formed on 1st November, 2000, partitioning from Madhya Pradesh. Raipur is the capital and it shares its border with Madhya Pradesh, Maharashtra, Andhra Pradesh, Odisha, Jharkhand and Uttar Pradesh. Chhattisgarh was primarily known as Dakshin Kosala whose mention is found in both Ramayana and Mahabharata. Chhatishgarhin Devi temple had 36 pillars from where its present name originates. Hilly terrain reigns the northern and the southern portion of Chhattisgarh. Around half of the state is covered with deciduous forest. Indo Gangetic plain and Mahanadi River basin drain different parts of Chhattisgarh and makes the soil fertile for cultivation. Tropical climate is dominant in Chhattisgarh. Summer season is quite hot while winters are pleasant. Average rainfall takes place in the monsoons. Tourists can visit during November -January which is the best time to explore this place. Chhattisgarh is well connected by railways and roadways. 11 National Highways pass through the state while State Highways connect the neighbouring states. Apart from Bilaspur which is the main railway junction, trains running across Durg and Raipur also connect major cities of India. Swami Vivekananda Airport situated in Raipur is the only airport in the state which serves commercial air services. Chhattisgarh's civilization is an age old one as we come to know through the archeological excavations at various parts of the state. Even natural beauty knows no bound all through the state. It is blessed with wildlife, forest, mountains and mesmerising waterfalls. 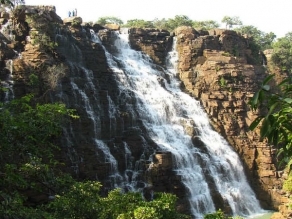 Some of the waterfalls are Chitrakote Falls, Tirathgarh Waterfalls, Chitradhara Waterfall, Tamra Ghoomar Waterfalls, Mandawa Waterfalls, Kanger Dhara, Akuri Nala, Gavar Ghat Waterfall and Ramdaha Waterfall. Ancient monuments and temples with rich cultural heritage are also a part of Chhattisgarh tourism. Most of these being unexplored gives the travellers a wonderful opportunity to explore the heart of India. Mallhar, Ratanpur, Sirpur and Sarguja worth a visit for their archeological importance. Bastar is the best place for nature lovers. Hot springs and caves are some unusual spots awaiting for the tourists. Indravati National Park and Kangerghati National Park in Jagdalpur, Gomarda Reserve Forest in Raigarh, Barnawapara Wildlife Sanctuary, Achanakmar Wildlife Sanctuary in Bilaspur and Sitanadi Wildlife Sanctuary in Dhamtari are some of the renowned wildlife sanctuaries and national parks in the state. Kotumsar Caves, Gadiya Mountain, Kailash Caves and few more caves are famous either for pre-historic paintings or pilgrimage. Bhoramdeo Temple in Kawardha, Champaran in Raipur, Damudhara in Janjgir-Champa, Danteshwari Temple in Dantewada, Mahamaya Temple are some of the pilgrimage sites where devotees are found thronging throughout the year. Anthropological Museum in Jagdalpur throws light on the lifestyle and culture of Bastar tribe. Bastar Palace is another historical attraction of Jagdalpur. Once upon a time it was the head quarter of Bastar kingdom though now it is completely protected under Government. All these and much more makes Chhattisgarh tourism so popular. 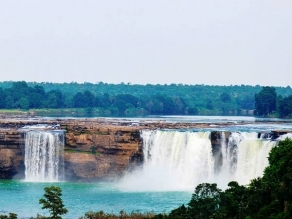 Chhattisgarh tourism throws a light on the inhabitants of the region. It is majorly inhabited by rural folk. Mostly tribes like Gond, Halbi, Halba, Kamar and Oraon stay here. Hindi is spoken by urban people while Chhattisgarhi, a dialect of Hindi is spoken by the rural folk. Kosali, Oriya and Telugu are also spoken by some tribes. Though women here belong to rural area still they are outspoken and independent. Most of the ancient temples here have female deity which shows the importance given to women since ages. A section of rural society harbour faith on witchcraft. People belonging to various sects reside here. Champaran is slowly growing popular amongst Gujrati community as it is the birthplace of Saint Vallabhacharya. Oriya culture is also popular in those areas where the state shares its border with Orissa. Kosa Silk sarees and salwar suites are renowned throughout India. Panthi, Rawat Nacha, Karma, Pandwani, Chaitra, Kaksar are some of the local dance forms of Chhattisgarh. People here also harbour interest towards theatre. Chhattisgarh is famed as the “Rice Bowl of Central India”. Most of the traditional and tribal food comprises of rice and rice flour. Local sweets and brew is also familiar in this region. Urban people of Chhatisgarh is engaged in various industrial sectors like power, steel, aluminium and cultivation of natural resources like forests and minerals. The state is also progressive regarding education. Many educational institutes are scattered all through Chhattisgarh. 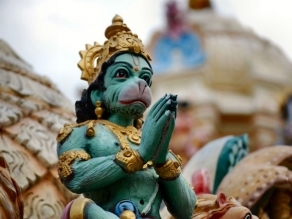 Ever Been To This Hanuman Temple Where He Is Worshipped As A Female?